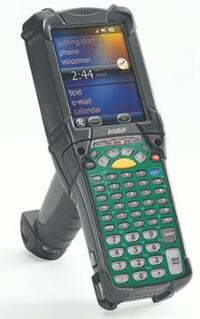 Motorola MC9190-G Complete Kit - Starter Kit Bundle That Includes the PDT - Wi-Fi (802.11a/b/g), Long Range 1D Laser Scanner (LORAX), Windows CE 6.0, Gun Grip, 256MB RAM/1GB ROM, 53 key keypad, VGA Color Screen, Bluetooth. Kit includes USB cable, cradle, power supply, and US line cord. The Motorola MC9190-GJ0SWJYA6WR-KIT is also known as MC9190-GJ0SWJYA6WR-KIT	or MC9190GJ0SWJYA6WRKIT	.